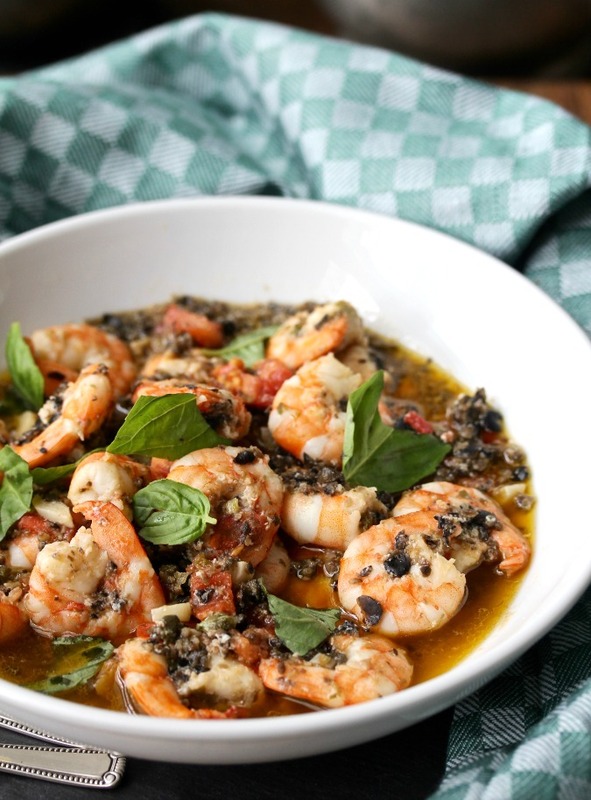 This sautéed shrimp with capers and olives is so easy to whip up with ingredients you probably have on hand. It takes about 20 minutes to make, and paired with rice and a salad, makes a fabulous weeknight or "company's coming" dinner. 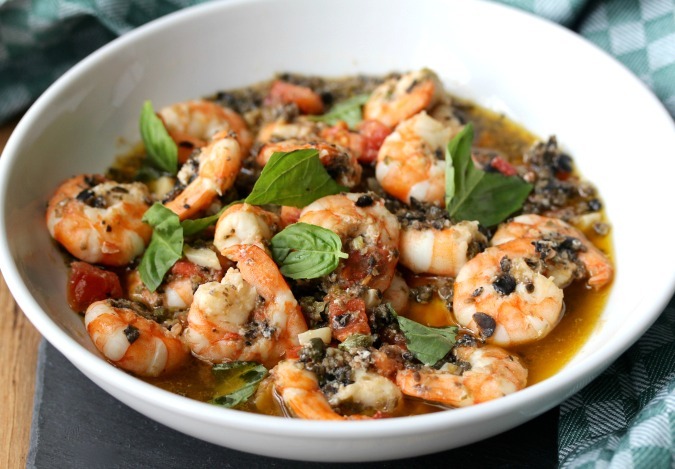 The sauce in this shrimp with capers and olives is also wonderful for dipping crusty garlic bread into too. This recipe is from Mark Bittman's Kitchen Matrix: More Than 700 Simple Recipes and Techniques to Mix and Match for Endless Possibilities. 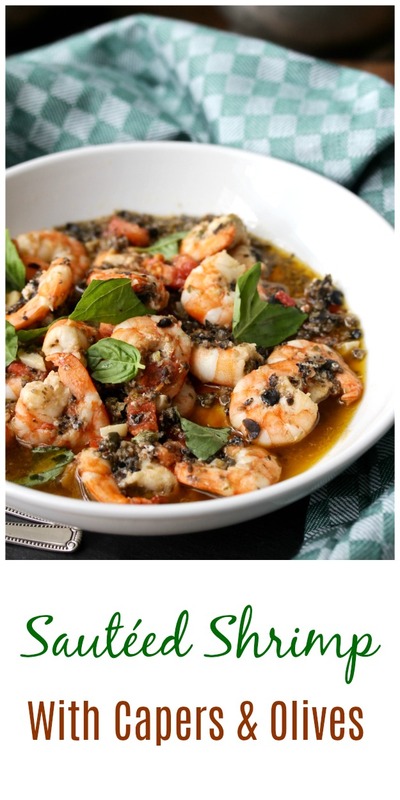 The section in the book on shrimp has 12 recipes on two pages, including sautéed, roasted, fried, and broiled shrimp. Each recipe is easy and tasty. 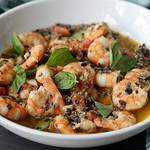 Here is a sneak peak from Mark Bittman's New York Times food column. I used frozen wild caught jumbo shrimp to make this dish. You can use medium, large, or jumbo shrimp, whatever's available. The shrimp will tell you when they are done by their pink color (for larger shrimp, cut one in half to make sure it's done). Camilla of Culinary Adventures of Camilla, and Wendy of A Day in the Life on the Farm have embarked on a one year project of cooking through the book. I'm jumping in when I can. For a quick and easy dinner, give this recipe a try! In a large skillet, heat the olive oil over medium low heat. Add the garlic, and cook until it turns light brown. Add the olives and capers, and cook for another minute or two. Add the shrimp and tomatoes to the pan, and sauté until the shrimp turns pink, 5 to 10 minutes. Season with salt and pepper to taste and garnish with fresh basil. Serve immediately. Karen, thanks for joining us! I eyed that recipe, too. Glad someone made it. I'll give it a try soon. Thanks Camilla! I almost went for the fermented black bean one but this one was soooo easy! I have the fermented black beans and wanted to try that one, but the troops wanted Cajun. This is a great choice Karen and on my list to make. You had me at shrimp. This looks really good Karen. Greek olive oil is my favorite!